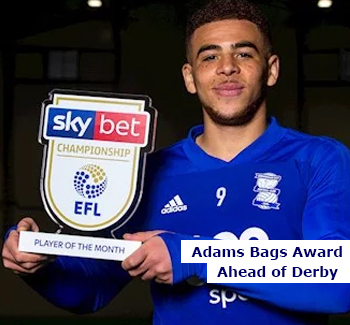 Ahead of Blues derby clash with their near neighbours across the expressway, Che Adams has been awarded the SKY Bet Championship player of the month award for February on the back of a six goal accumulation which included a hat trick at QPR and brace against Blackburn Rovers during that period. Adam’s has been the most improved player at Blues since the appointment of Garry Monk last February who has helped transform the rather inconsistent forward of old into a player who has netted 21 league goals in 35 appearances already this season. 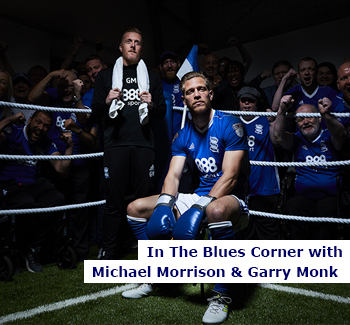 Although Blues have not faired well against their city rivals since they were relegated to the Championship in 2016, the spirit and togetherness that Garry Monk has created within the squad since has seen Blues punch well above their weight this season and a victory against Sunday’s opponents cannot be ruled out. And dependant on the punishment that is meted out by the EFL regarding a points deduction; Blues could well find themselves finish above the big spenders from Aston. weekend against Queens Park Rangers. their passion and dedication for the team to survive. I have been given the opportunity to go to Rwanda to help install IT equipment into 2 new schools in Kigali for street children set up through the charity Rwanda Legacy of Hope in March. The equipment has been donated by Plymouth College of Art and Design, however the shipping costs need to be raised. I am looking for support to enable this to happen. The shipping costs are around £4000 however I have already received a number of donations, hence the total needed now is £1,405. 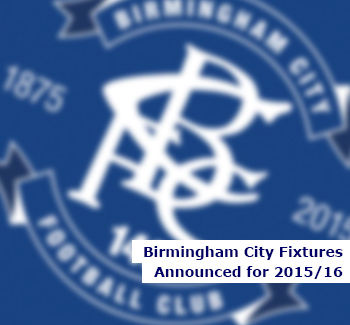 Birmingham City have kindly given me 2 match day tickets to help raise further funds. There is a choice of either 2 tickets for the Middlesbrough or for the Hull games. To be clear, it’s an either / or! 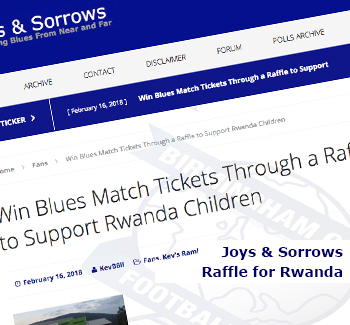 As it is a raffle you need to buy a ticket for the draw. The cost is £5 per ticket. The payment must be made via paypal to joysandsorrows@gmail.com Your name and email address will be put into the pot for the draw. You can purchase more than one raffle ticket which will multiply your chances of winning. So if you buy 3 raffle tickets your name will be added 3 times. The raffle will run until 17.00 on Friday 23rd February. If you want to ask further questions or would just like to donate and not be entered into the draw, contact me. All the money raised will either go to the total required to pay the shipping costs or if we meet that, will be donated to Rwanda Legacy of Hope charity. Kevin Ball Owner of Joys and Sorrows. 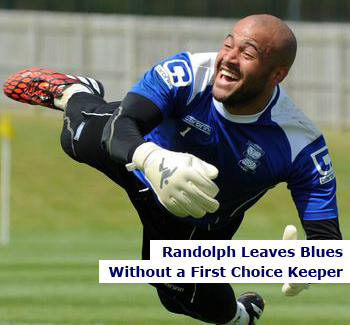 The scaremongering amongst some Blues fans is understandable given the loss first choice goalkeeper Darren Randolph and the release of his understudy Colin Doyle. But please don’t fear, Gary Rowett is here. Blues have been linked with their former reserve stopper Adam Legzdins, who they released in 2008. Many have taken this as a sign of failure to attract a number one.